Reading between the lines of text and textile, Poetry & Popular Culture correspondent Adam Bradford writes in about mid-19th-century mourning poetry and the poetic wrap (not rap) that Eliza Howells quilted to help stave off the chills of death and grief. Dealt the last final blow? That struggled to be free? 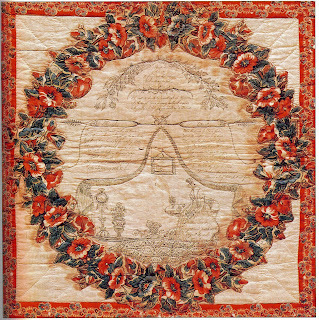 Sigourney’s poem may strike contem- porary readers as trite or contrived, but for many people in 19th century America — people such as Eliza Howells, whose quilt square appears to the left—such poetry was an important tool for dealing with grief. Sometime in the 1840s, Eliza Howells began accumulating a number of quilt squares as gifts from family and friends. Largely commemorative, these squares mark important events in Eliza’s life such as her wedding in 1843 and her Grandmother’s death in 1845. The same grandmother whose death is commemorated on one square, in fact, produced the square celebrating Eliza’s marriage. Are whispering still to me. Bears a leaf that shall not fade. Together, these poems suggest how the quilt enlivens the people who helped produce it while simultaneously prefiguring Eliza's reunion with them in the "ever vernal" afterlife. Crafted as it was by hand (or hands), it quite literally served as a site where Eliza could stitch, bind, and tie herself to those, like her grandmother, who had not only helped produce the blanket's other squares but who were commemorated there as well. Morbid? Maybe. But for Eliza, who could wrap herself in the combination of image, text, and material—and perhaps for more than just a few people in our current day—it was one way to keep warm against chills borne of gale or grief. Adam Bradford writes in from the University of Iowa where he is finishing a dissertation on the literature of 19th century American mourning practices.